Cafe made fresh soups for your gathering. 2 gallon soup crock(32 cups) for cafe gathering, delivered catering or pick up. 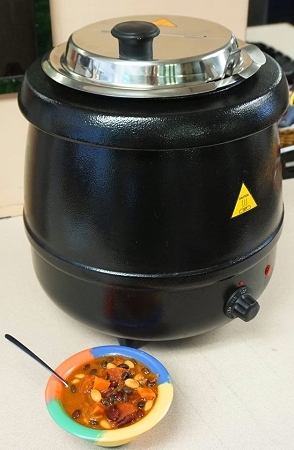 Soup is delivered hot and ready to serve in a 2.5 gallon crock pot. There must be an outlet provided to keep the soup crock hot. Paper bowls, plastic spoons, napkins, and ladle are provided. Equipment must be returned within 48 hours of event.